A perfect round of Martha's Flaky Pastry. In working towards creating a more efficient and sustainable kitchen, over the years I have learnt that it is really not a bad idea, in an effort to prepare for life's certain uncertainties, to ensure that there be always a slab (or 2) of home made Flaky Pastry (otherwise know as Rough Puff, a simpler, easier and less time consuming version of Puff Pastry), in the freezer. Well, I suppose any pastry. But as I find Flaky to be the most multifunctional, Flaky it is. I don't make it nearly enough. But I'm hoping to learn from my mistakes. And in so doing, assist you in avoiding any last minute crises. Rolling out Flaky Pastry discs into cling film. Place 3/4 of the chilled butter cubes into the freezer (until butter is firm and you cannot leave a finger imprint on the cubes - dependent on the freezer, but for me , about 15 mins). Into a food processor, add the flour, salt, and sugar. Pulse to mix (about 10 times). Add the 1/4 chilled butter to the processor and pulse until well combined. 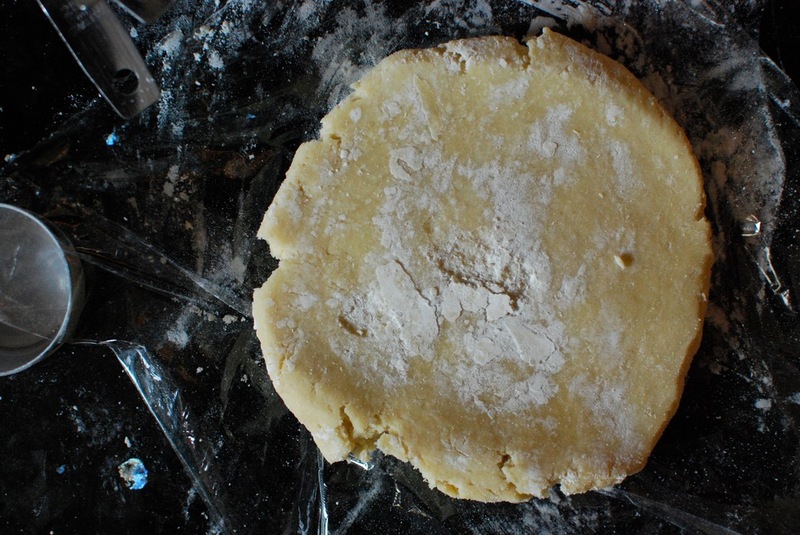 Add the frozen butter cubes to the processor, and pulse until an almond meal texture is attained, while allowing a few larger blueberry sized clumps of butter to remain (giving the pastry its flakiness - about 10-15 times). At this stage add the ice water and pulse until just incorporated (10 or so times). On a lightly floured work surface, pour the contents of the food processor. With lightly floured hands, press the mixture together until it becomes a nice smooth dough ball. No kneading necessary. Halve the dough - while you can save as 1, I like to freeze it as 2 separate discs, to allow for more varied use. Place dough in between 2 sheets of cling film/plastic wrap (or 1, folded over), and press/roll into about a 1cm/.5in thick disk. Wrap tightly, and place in the freezer for future use (though if you wish to use immediately, chill for at least 45 minutes). Quiche/Tart/Pies - blind bake the dough at 180*C for about 15-25 or so minutes, depending on size/thickness (until lightly browned), or per your recipe's instructions. Stay tuned for recipes using this Flaky Pastry!